Edward Huber, president of the Huber Manufacturing Company, Marion, Ohio, died at his home in Marion, August 26th, as the result of an attack of neuralgia of the heart of but a few moments duration. The members of his immediate family, with the exception of his son-in-law were unfortunately absent from the city, Mrs. Huber and her daughter, Mrs. Schroeter, being at Nyack, New York, for the benefit of the health of Mrs. Huber who was recently injured in a runaway accident; while Mr. Frank Huber was at Cedar Point attending to the preliminaries incident to the annual outing which was to have been given the employees of the Huber Manufacturing Company the following day. Mr. Huber had passed the day in his customary fashion looking after his various business interests. When he reached home, Mrs. John Huber, who with her family was a guest at the Huber residence during the absence of the family, noted that he was in excellent spirits; although he complained of neuralgic pains. After a hearty supper the pain increased and a physician was called. Prior to the doctor's arrival, Mr. Huber insisted that he should enjoy a drive through the city, but being advised by the doctor that he needed rest, he retired shortly before 7 o'clock. The medical advisor though little of the trouble complained of, and, after a short consultation with Mr. Huber and the household, left him, believing that morning would find him in his usual health. But some five minutes after seven Mr. Huber passed painlessly into the Valley of the Shadow, so peacefully that Mrs. Huber and his grandson, Edward Schroetcr, the only watchers at his bedside, scarcely noted the summons. While these events were passing, those rich in the good-will and sharing in the prosperity of Marion’s greatest benefactor, were looking forward to a day of pleasure at the lakeside, and in preparation for the coming excursion thronged the streets or stores and enjoyed the band concert arranged for the evening. The announcement that death had smitten the leader of industrial forces came as a most unwelcome message, and was but half-believed until confirmation came with the darkening of the gala signs. Edward Huber was born in Kelso, Dearborn County, Ind., September 1, 1837, and passed his boyhood on a farm near there. He was the youngest son of Phillip Huber, one of four brothers, who came to this country from Germany, Phillip being a cabinet maker, and after following his trade for a time, in the East, located on a farm near Kelso. After several years on the farm, Mr. Huber was apprenticed to the trade of blacksmith, and while there was afforded an opportunity to study mechanics, a study which was to absorb his entire life. In 1865 he went to Marion and in the same year he married Miss Elizabeth Hammerle, of Kelso, and shortly after the marriage her brother came to Marion, watchful for an opportunity to enter business. The result was the organization of the firm of Kowalke & Hammerle. Mr. Huber was engaged as the superintendent of the manufacture of small articles and the planing mill business, which they established. In connection with the planing mill, the firm began the building of the Huber rake, and in due time the demand for the rake became such the partnership was-increased by the addition of Mr. Huber, who had been unable to enter the business sooner because of his inability to secure any money whatever. In due time the scope of the work was enlarged by the invention and construction of the revolving road scraper, which found a ready market. Five years after Mr. Huber’s arrival in Marion, Mr. Hammerle retired from business. Mr. Kowalke had already retired, and the partnership of Huber, Gunn & Company was organized. Mr. Huber had invented a steam engine, which was such a great improvement over anything on the market that it promised well, and the new partnership was formed to engage in engine manufacture. The succeeding four years brought some measure of success, the Huber engine being welcomed wherever it was introduced, and in 1874, the Huber Manufacturing Company was organized with a capital stock of $75,000. The company prospered, improvements were made, and in 1880, the organization turned its attention to the manufacture of threshing separators, as well as engines. When the first traction engine appeared in the field, Mr. Huber began his studies in that direction and soon after the Huber traction engine was an active competitor in the field, and was awarded the recognition which a superior article always receives. Within nine years the business had outgrown its quarters in what is known to every one familiar with Marion as the old Huber shops, between Main and Prospect streets, and a change of location was made to the present site, which includes about twenty acres of shop buildings, and is one of the finest plants in the country. Some 700 workmen are employed and the company has a capitalization of $500,000. The business of the company amounts to about $2,000,000 annually and Huber threshers and engines are not only used in every important wheat growing section of the United States, but are to be found in many quarters of the world. 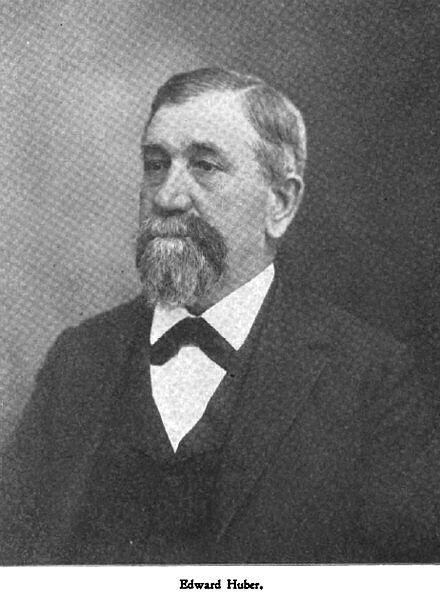 At the time of his death Mr. Huber was president of the Huber Manufacturing Company, president of the Marion Steam Shovel Company, president of the Marion Malleable Iron Company, president of the Marion Implement Company, president of the Marion National Bank, vice-president of the Marion Milling Company and treasurer of the Marion Building and Loan Association. Until recently he was president of the Marion Electric Light Company and was a leading stockholder in the Marion Street Railway Company. “The death of Edward Huber brings to Marion a public bereavement—a public loss and general sorrow. The whole community is inexpressibly shocked and grieved. The lack of warning and the untimeliness of it have intensified the genuine sorrow. No one life in Marion was so closely linked with the city's material development; no one life in Marion contributed so much to the prosperity and welfare of the community. Mr. Huber’s career was contemporary with the development of the industrial city of which we boast, and the chief and commanding figure in its development. Without dreaming of the possibilities of the industrial era, which he was to figure in, Mr. Huber modestly and unpretentiously gave Marion its start as a manufacturing city. The start was unpromising enough and the early experiences unsuccessful enough to have discouraged the ordinary man. But in the face of discouragement, he pushed on and on. His courage never forsook him, though failure, portended. In the late seventies his toil and perseverance began to bear fruit and the great Huber works of today were firmly on the highway of development. Returns brought him means, and his love of achievement and his pride in Marion led him into other lines. With a confidence in his judgment and a faith in Henry Barnhart, he gave his credit and his capital to the Steam Shovel development, and the big Steam Shovel, plant of today, the largest in the world, is a living monument to his mechanical and commercial capability. These two great factories alone would serve as lasting monuments to any man, but they are not all. The corporate era dawned with his earlier success, and the name of Edward Huber was listed in a score of corporate directories. When one drifted to embarrassment, he loaned his credit or subscribed added capital to keep it off the threatening rocks. The Malleable Iron Company is a notable example, He was in fact the life and soul of industrial Marion, and when not directly associated or interested was the inspiring example that gave life to those institutions which have grown up to emphasize the worth of the works he wrought. He had a sincere interest in the welfare of hundreds of workingmen to whom his shops gave employment, and he encouraged and assisted them in getting homes. Every movement for civic good or common weal had his cordial support. His encouragement of individuals can never be recorded. Mr. Huber had a just and natural pride in his accomplishments. Three decades of exceptional activity brought returns that might well have crowned the most ambitious life. He worked hard and earned the full measure of his achievement. There was a heartache that he was misunderstood and misrepresented by some of the malcontents who attempted to spread dissention in the laboring forces to whom he opened the fields of employment, but his tongue gave no utterance to the grief of the heart. He pushed uncomplainingly on, secure in his consciousness of a course rightly laid and honorably followed, and when death touched him he wore the crown of love and good will of the community he honored and enriched.